It is vital that students of grade 2 picks up the basics of place values before moving on to higher topics. 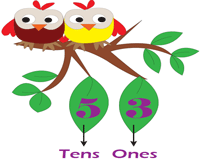 Pin up this collection of eye-catching place value charts to familiarize children with place values in ones and tens. Customize our poster templates to make learning more fun! 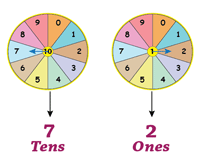 Every digit in a whole number contains a place value. Reiterate this fact with this colorful spinner wheel poster. 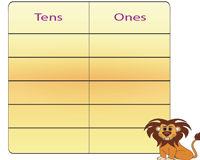 Put it up on a bulletin board and help learners identify place values in ones and tens. Pin up this attractive chart with birds perched on a branch! Get students to learn the basics of place values with this charming poster. Use the template to suit your needs. Look at these cheerful posters that display two digits of a whole number. 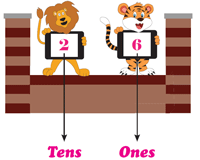 Distribute these print-ready charts and ask learners to pick out the number of tens and ones. 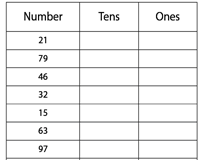 Hand out these place value charts to children that are available in both color and monochrome. Write a few whole numbers on the blackboard and ask them note down its place values on the charts. Track, review, and reinforce comprehension of place values with this compilation of worksheets that provides for plentiful practice. Download the entire set to test a young learner's analytical skills!